Oftentimes my cartoons for the Whole Living Journal are based on the season, so drawing a summer camp cartoon made sense for this issue. But as with anything I do, my cartoons are usually plastered with symbolism that I love to scry through to find more and more meaning. The symbols in this cartoon took me to a lot of places I had already traveled. Apparently I needed a few reminders. So I started with the obvious, that the comfort zone is just another name for what we think we know, which isn't always comfortable, accurate, or fun. It is pitched like a tent in the lessons of childhood. "Okay, cute." I thought of the tent symbol, but I was certain there were more symbols in the cartoon, so I kept looking. Quickly the tent became the mind, and the two children inside represented the right and left thinking. I took a moment to add a little more to my drawing just to see it better. The drawing showed the reverse of what I expected. I typically associate the right brain with imaginings outside the comfort zone, while I usually think of the left brain as the fortress of rules built to protect us from the unknown. The right side was worrying and the left side was accepting. When I allowed for different interpretations of "right" and "left", I could see that it often seems "right" to exercise caution, even doubt, in order to make sure I am being safe about what I do. Then I could see what was "left": No matter how well I plan and wait to take action until I'm sure, change from beyond the comfort zone is inevitable. Even so, comfort zones are fairly indestructible. So instead of being about getting out of the comfort zone or trying to dismantle it, this cartoon seems to be all about flipping its negative bent and using its imaginative ability toward something more positive. We can change the assumption that unforeseen circumstances can cause difficulties if we are not prepared, and practice using our comfort zones to invent rather than prevent. When we imagine in this way the comfort zone takes on a whole new meaning. A final look at the cartoon symbols affirms that even in the dark of night, surrounded by the unknown, there is a light within which will help us see, and a reflection of the day to come. It is not change we need to challenge, but the challenge of change that is ours to accept and fully appreciate each the moment. Imagine that! Enlightenmeant Cartoons: Now What? Ask and you shall see. Live a Little - More! Explore, engage, and enjoy your unlimited creative nature through art practices, creative life coaching, and more, offered through The HeartStudio! Use the contact form below to drop me a line! 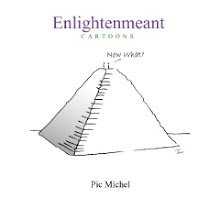 EnlightenMeant Cartoons Content is licensed under a Creative Commons Attribution-Noncommercial-No Derivative Works 3.0 Unported License.